We made our way to Timpohon Gate (elevation : 1866m) with perfect weather that morning, and sat in the shuttle van satiated after a heavy breakfast from Balsam Cafe. With both a packed lunch and our climbing permits in hand, we went to the counter to sign-in before we set off down the trail. By then, it was 09:10. The very wide 'trail' was more of a stairwell through the jungle than an actual trail. 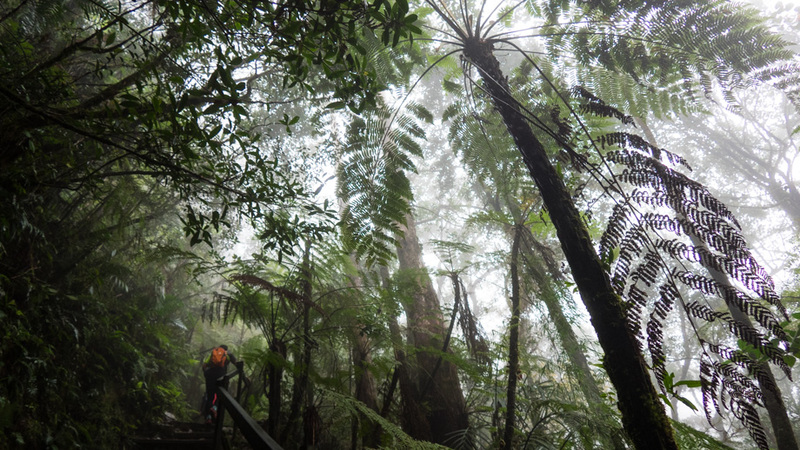 It began with a short descent to the tiny Carson Waterfall, before beginning a long ascent to Laban Rata (elevation : 3272m), which was 1350 metres higher up and 6 kilometres further along the trail. Starting at Timpohon Gate meant that we were to completely skip one of the four 'floristic zones' that Kinabalu Park had to offer--the 'Lowland Dipterocarp Forest', which lies below elevations of around 1200m. Instead, we were flung straight into the second zone, that of the 'Lower Montane Forest', roughly situated between the elevations of 1200m to 2200m. The trail was fringed with ferns of all shapes and sizes. Towering tree ferns (Cyathea spp.) and their huge doubly pinnate leaves created tunnels over us, whilst the tightly-coiled croziers, or fiddleheads, atop the stalks of emerging fronds were scattered around on the sides of the trail below us. These fiddleheads are coiled to protect their tender tips, but slowly uncurl themselves as the frond hardens and toughens in a process that is referred to as circinate vernation. The huge leaves of the primitive fern Dipteris conjugata were ubiquitous here, whereas other ferns like Cheiropleuria bicuspis were few and far between. Over 600 species of ferns including 22 species of Cyathea tree-fern--50 of which are endemic--can be found here in Kinabalu Park. The higher elevations and the high humidity of the lower montane forests create conditions that are perfect for the development of peat. This is because the amount of partially decayed organic matter is highest when the temperatures are sufficiently high for plant growth, but are too low to sustain the microbial activity that helps the organic material break down. These conditions tend to also be ideal for epiphytes such as liverworts and mosses such as peat moss (Sphagnum junghuhnianum), which carpeted absolutely everything in some sections of this trail. This moss actually comprises of two layers: the upper layer which you see at the top is live-growing moss cover, whilst the layers that lie beneath are known as sphagnum peat moss, and are composed of decaying organic matter. Peat moss is acidic and very absorbent which makes it both an anti-bacterial agent as well as a fungicide. This moss was apparently even used as a dressing for wounds during both World Wars! The long stalks of giant hairy-cap moss (Dawsonia longifolia) also were ubiquitous on the trail. This moss is very common in the area and can grow to as tall as half a metre, making it one of the tallest mosses in the world. Unlike other mosses, Dawsonia mosses have a conduction system that is similar to that of vascular plants, and this is what allows it to achieve such great heights. The conduction systems are not the same however, as they evolved independently through convergent evolution. Most mosses require water for sexual reproduction, as the sperm requires a unbroken layer of water to be able to swim to the eggs to fertilize them. In the case of Dawsonia mosses however, their height makes this impossible. The sperm are instead dispersed when rain drops fall onto the gametophores and splash onto the forest floor.